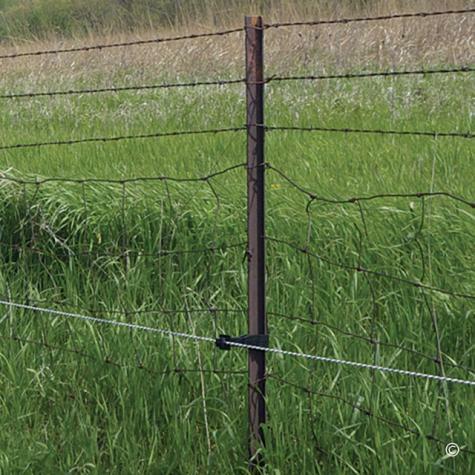 Achieved by simply adding a “live” strand of rope (our preference due to its visibility), HT wire or MaxiShock to existing permanent wire fences. 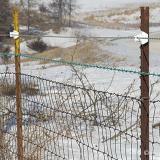 The added “hot” wires keep predators and livestock from leaning on or attempting to pass through or over the existing fence. 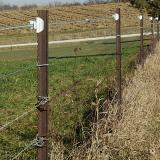 The strands are supported by insulators that hold the strand 6"–8" away (offset) from the existing fence. As you can see in the photos, the existing fence is rusted and old. Energized strands can either be added to or replace existing wire strands. The result isn’t as pretty as a brand-new fence. But it does work. 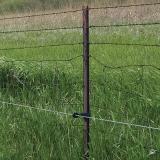 Attach an insulator at both end posts and as many insulators as the situation requires to keep the energized strand the same distance away from the existing fence and the soil. Tension rope and MaxiShock hand-tight--and HT wire twice that. Use insulated cable buried underground to cross gateways. It's useful, but not essential, to install switches at end posts.